Riley, a veteran of interstellar war, is one of many beings from many different worlds aboard a ship on a pilgrimage that spans the galaxy. However, he is not journeying to achieve transcendence, a vague mystical concept that has drawn everyone else on the ship to this journey into the unknown at the far edge of the galaxy. His mission is to find and kill the prophet who is reputed to help others transcend. While their ship speeds through space, the voyage is marred by violence and betrayal, making it clear that some of the ship's passengers are not the spiritual seekers they claim to be. Like the pilgrims in Chaucer's Canterbury Tales, a number of those on the starship share their unique stories. But as tensions rise, Riley realizes that the ship is less like the Canterbury Tales and more like a harrowing, deadly ship of fools. When he becomes friendly with a mysterious passenger named Asha, he thinks she's someone he can trust. However, like so many others on the ship, Asha is more than she appears. Uncovering her secrets could be the key to Riley's personal quest, or make him question everything he thought he knew about Transcendentalism and his mission to stop it. 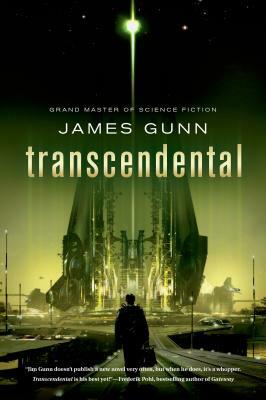 James Gunn's Transcendental is a space adventure filled with excitement and intrigue that explores the nature of what unifies all beings. JAMES GUNN is Emeritus Professor of English at K.U. and has published more than a dozen novels and half a dozen collections of stories, and has edited more than a dozen and a half books. His best-known novels are The Immortals, The Dreamers, The Listeners, Kampus and The Joy Makers. The Immortals was filmed as The Immortal and became a TV series. His academic publications include Alternate Worlds: The Illustrated History of Science Fiction, The New Encyclopedia of Science Fiction, the six-volume anthology The Road to Science Fiction, The Science of Science-Fiction Writing, Speculations on Speculation: Theories of Science Fiction and Inside Science Fiction.